Note: Cemetery access is available 24 hours a day. Rav Gross was a talmud of yeshivas Torah Vo’Daas where he was ordained (I saw his semicha letter, I think it was from Reb Shlomo Hieman). He was a life-long Seforim collector, he had a house in Williamsburg on Ross St. together with his brother Shimon (both of them never married unfurtunatley) where famous Talmidie Chachamim settled to learn there and benefit from the monumental Otzar Hasforim. 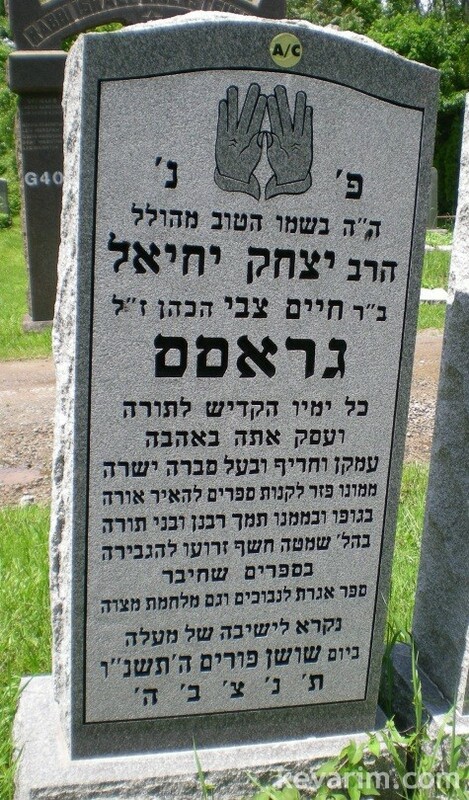 After thier passing, the Otzar was moved to Kiryas Joel, Monroe where it is now being used daily by hundreds of Kollel and Yeshiva personnel, to the great zechus of the Gross brothers. YD, in the days before computer based libraries, their library was an אוצר with a huge value.